Have you ever been on a long road trip? It can be fun, right? Or you at least try to make the most of it. You pack yummy snacks and drinks. Maybe some books and magazines. Great music. You play license plate games, point at all the funky looking buildings and signs you drive by, and sing silly songs. With the right and willing company, road trips can be an enjoyable bonding experience. And with every long road trip comes the inevitable pitstops. You must stop for gas. Clean the windshield. Stretch your legs. When Mother Nature calls, which can be every hour if you have small children. You might even stop to take in some sights along your journey. Pitstops ensure you’re capable of making it to your final destination and work to re-energize you for the next leg of your trip. Growing a business can be like taking a long road trip. After all, you set production, subscriber, client, revenue, and profit goals for yourself just like you set goals of reaching a particular city, hotel, or campground by nightfall. If you stay focused and on track, tackle your high-priority tasks, manage your day-to-day operations effectively, and take care of yourself, you successfully reach a new level in your business, just like you reach your final destination if you keep your eyes on the road, follow the GPS, prevent the kids from killing each other, and fill up when the tank demands it. Without making pit stops for gas, you wouldn’t have an operating vehicle to drive to your final destination. The same goes for running your business. You must invest in short term for the long term. Tackling pesky administrative or other tedious tasks is often a must, even if it means having to stop your workflow. Yes, in the world of business, pit stops are vital to the success of your entrepreneurial journey. The good news is the right pit stops will not only help you grow your business, but they’ll increase your productivity so you get there faster. Productivity pit stops are when you purposefully stop your workflow to take an action that actively kicks your productivity up a notch so you can work more efficiently moving forward and thus streamline achieving your goals. 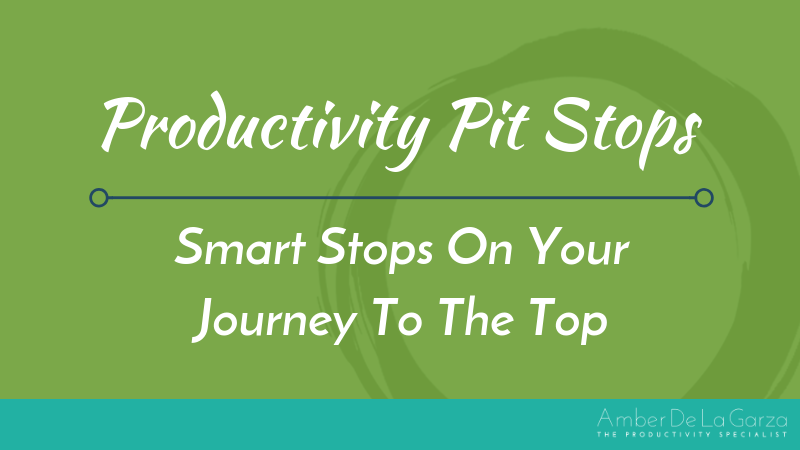 Here are some of my favorite productivity pit stops that can greatly benefit you. Thank you for contacting me about (issue). I understand it’s a huge concern and I assure you I‘m fully dedicated to resolving the matter quickly. I should have an update for you in (x) days and will email you promptly. Until then, if you have any additional questions or concerns, please don’t hesitate to call me at (555) 555-5555. Email templates such as this can easily be personalized for each recipient. It might take you an hour to create your email templates initially and you’ll likely want to create more over time. However, you will save minutes of precious time every time you utilize a template in the future which compounds over time to give you hours and maybe even days of additional work time. Only create email templates after you’ve had to write the same email a few times and foresee needing to write it again. I love Text Expander for creating email templates. If you’ve ever bought anything online, you probably wound up a subscriber to an online store. It’s often in the fine print of the checkout page or adjacent to a tiny box you failed to unclick. The next thing you know, you have seven Big Sale! emails in your inbox from Pottery Barn. You don’t click on the emails because you’re no longer in the market for home décor following your sofa purchase. Or maybe you do click on each one and promptly delete it because you hate the sight of a full inbox. Either way, you’re wasting valuable time. You’re wasting time leaving the emails in your inbox because they act as a visual distraction, keeping your attention away from important emails. You’re wasting time deleting the emails because opening and deleting takes time, they keep coming and coming, and you have no intention of making another purchase at Pottery Barn anytime soon. Take the time to stop and unsubscribe from email subscriptions that fail to provide you value so they stop taking over your inbox and decreasing your productivity. It may take an hour initially but it will save you loads of time over the course of a year. Unroll.me is an app that enables you to conveniently and quickly unsubscribe from multiple email lists. Whether you’re a coffee drinker or not, you probably know that no amount of caffeine can keep you running at full speed all day long, day after day, week after week. Naturally, your energy dwindles and your focus drifts when you attempt to work on a single task for several hours. You might even fall prey to checking social media throughout the day each time you lose focus. When you do so, you waste valuable time. One minute becomes ten then you wonder where your day went when the clock strikes five. When you can’t focus and you don’t have energy to continue working productively, you waste time. You’re wasting time succumbing to external distractions. You’re wasting time internally distracting yourself. You’re wasting time not having the brainpower to tackle your tasks. It may seem counterproductive but you have to stop and take occasional breaks throughout your workday. Breaks enable you to refresh and return to your work with increased focus. They also provide you with more energy so you can have the endurance to work productively for another good stretch of time. Breaks don’t have to be long and they certainly don’t mean you have to completely shut down. A break is anything that gets your mind off your work, even for a few minutes. Consider eating a healthy snack, listening to a podcast, meditating, stretching, taking a walk, working out, reading a magazine, listening to music, chatting with co-workers, taking a nap, or checking social media (for a limited and pre-determined amount of time). These activities are totally fine and even beneficial to do on scheduled breaks! Even schedule lunch breaks on your calendar to make sure you actually get to eat. As an entrepreneur, or even as a human being living in the 21st century, you likely have a cell phone with you most of the day. Between the texts, calls, emails, deals, alerts, alarms, and notifications you received today, how many times did it make a noise? Five? 50? Every time your cell phone or any other device makes a noise, you waste time. That’s because whether you actively acknowledge the noise or not, you hear it and therefore you lose focus. Noises act as audible distractions, which interrupt your focus for minutes, not just seconds. When a notification sounds, you might keep working but you will not be working at the same level of focus you were at previously for several more minutes. Audible distractions you don’t react to waste time. Audible distractions you do react to waste time. 24% of workers admit to spending at least one hour each day on personal calls, emails, or texts. If you’re unaware your phone just received a text or a Facebook notification, you won’t feel the need to look at it. Take the time to stop and turn off all of the unnecessary chimes, dings, and rings that tend to distract you – especially when you’re working on your high-priority tasks that demand completion in order to grow your business. Instead, plan ahead to check your notifications during your (you guessed it!) scheduled breaks. These steps make up the process that should occur every time a client’s check is received. If one step is missed, the error could have time-wasting or even revenue-wasting effects in the future. You could send a client a late payment notice for an invoice they’d already paid, resulting in an unpleasant email reply that needs your attention. Failing to deposit the check within a reasonable amount of time could result in losing it among the papers on your desk or your junk mail and be thrown out. For every process and system you have, it is not enough to just have the steps in your head. You need to stop and write the steps down. Create detailed checklists to decrease errors in your recurring tasks. Doing so will also remove the time and brain power you waste trying to remember next steps or where you left off, should you have to step away from the task. Checklists also come in handy when you delegate tasks to others. Instead of spending valuable time wracking your brain for every necessary step in a system, then dictating those steps to employees, you can just refer them to the checklist for that system. My Procedure Manual has been a life saver. I rely on it for consistency in my assistant’s work, not just my own. Working off checklists is a great way to create efficiency for tasks you do repetitively in your business. My favorite program to manage my checklists is Trello. I also offer a Trello course if you want training on its awesome features. You’re an entrepreneur who is eager to grow your business. And to do so, you need time but you have so little of it. You’re overwhelmed by all the duties required of all the different hats you wear. You’re the president, CEO, CFO, sales manager, janitor, and everything in between. You have responsibilities to your organizations, investors, religious institution, employees, friends, and family. You are spread ever so thin. That’s why asking you to periodically stop your workflow may seem counterproductive. On the contrary, you shouldn’t attempt a long road trip without making pitstops for gas and you shouldn’t try to grow your business without making some necessary productivity pitstops. It’s true what they say. You reap what you sow. Consider the long-term benefits of being productive and invest your time today to reap bigger rewards in the future. The time you take to stop and kick your productivity up a notch will make you more effective, streamline your success, and improve the quality of your entrepreneurial journey to the top.